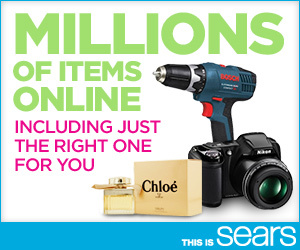 Find Everything You Need and More at Sears.com! This is a Sponsored post written by me on behalf of Sears for SocialSpark. All opinions are 100% mine. Have you ever been out shopping, and found the perfect outfit…only to find that it was sold out in your size? I hate when that happens! I’ve started doing a bit of online shopping because stores like Sears carry so many more sizes and colors than you’d find at your local Sears! Sometimes Sears even has entirely different things online – which makes shopping all that more fun! You don’t even have to worry about waiting around for that awesome new outfit to arrive because you can buy things online at Sears.com and then just schedule an in-store pickup! Sears guarantees to have your purchase ready in 5 minutes or less, or you’ll get a $5 in store coupon! In addition to carrying a wider selection of colors and sizes on Sears.com, Sears also carries more brands and styles than they do in your local stores! Think about it…while your local store is limited in how much merchandise they can physically hold in one location, the power of shopping the internet means limitless possibilities! Sears now carries brands that you’d be surprised to find on Sears.com. Brands like Ray Ban, Michael Kors, DeWalt Tools, Steve Madden, Nike, Vince Camuto, Tory Burch – always check the newest arrivals to make sure that you don’t miss any great new pieces! Sears is adding hundreds of new styles, colors and designers every day! 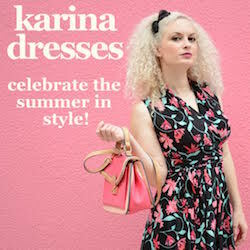 Whether it’s a new swim suit for that summer vacation to the tropics, a new hand bag for an upcoming birthday, or just a few pretty sundresses (my favorite summer wardrobe staple) to wear out and about when the temperature begins to rise, Sears.com has you covered! Check out Sears.com and the featured marketplace offers to see the new lineup and don’t forget to tweet your friends and family to let them in on your discovery! The Sears closest to me shut down. Good thing I can still buy online. I have always loved shopping at Sears, but I’m afraid it’s going to shut down any day in my area. I have found the cutest clothes at Sears. I’m happy here is one close by. I love shopping online and their new layout makes it so easy. I need to check out their online selection. Only recently did I discover their online inventory was different than in-store. The have some cute stuff! I often find great things online at Sears! We like to shop at Sears since there are items to please me AND Hubs. Can’t say that for too many stores. I love that Sears offers so many things. It’s definitely convenient one stop shopping. I have shopped at Sears for years. I think they were one of my first department store credit cards! They really do have everything! My parents shopped at Sears all the time but there aren’t too many left where I live. We are there all the time for tools. My husband loves them! They really do sell a wide variety of items.